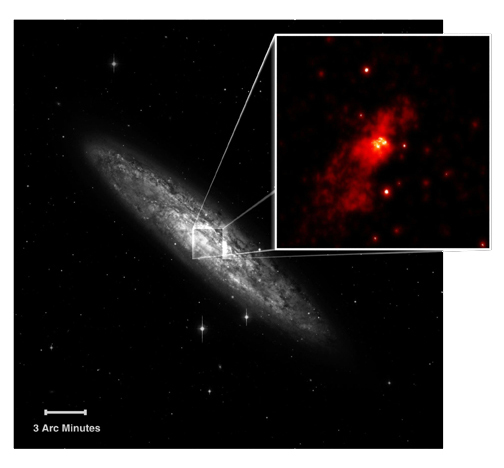 This Chandra X-ray image (inset) shows the central region of the starburst galaxy known as NGC 253 in comparison to the optical view. Chandra detects a proportionally high number of suspected intermediate-size black holes – a recently discovered class of objects. NGC 253 has at least six so-called ultraluminous (very powerful X-ray) point sources, and Chandra shows that four of them are located within about 3,000 light years from the galaxy's core. This relative close distance may imply that the ultraluminous objects -- which are usually found slightly farther out -- are gravitating towards the center of the galaxy. NGC 253 is a starburst galaxy located some 8 million light years from Earth. Starburst galaxies are regions where stars form and explode at an unusually high rate. 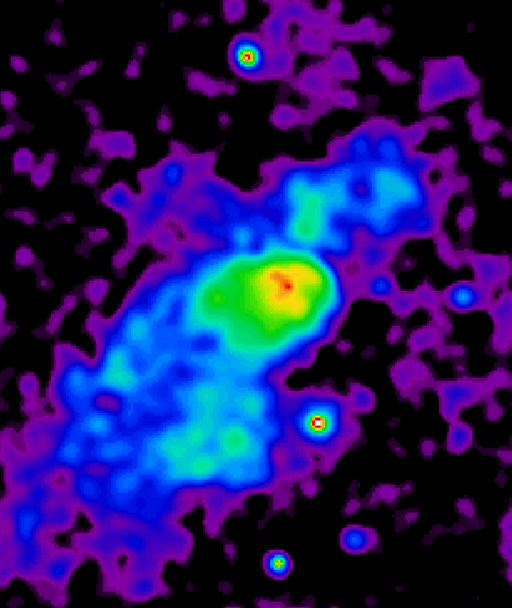 Chandra observed NGC 253 with the Advanced CCD Imaging Spectrometer (ACIS) instrument for 3.6 hours on December 16, 1999. Scale Image is 2.2 arcmin across. Coordinates (J2000) RA 00h 47m 33.10s | Dec -25° 17´ 18"